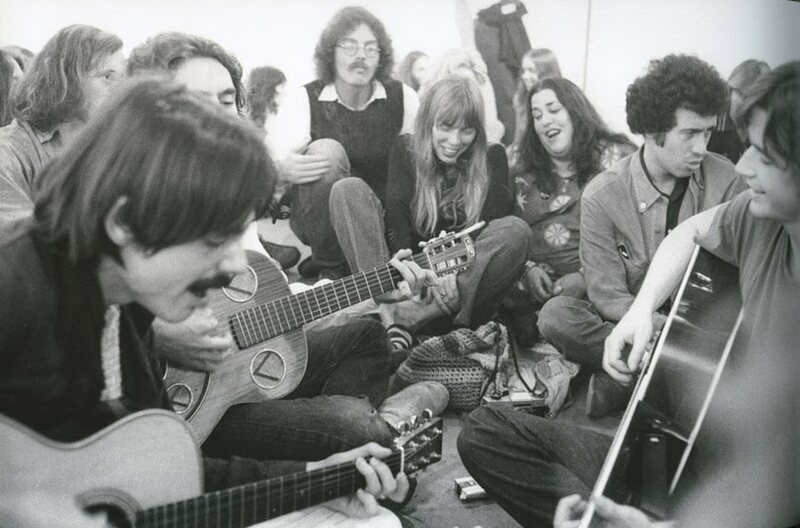 The thriving music scene in California was now home for Mitchell as she began hanging with (below) her musical counterparts such as (L-R) newcomer Jackson Brown, Joni Mitchell in center, Mama Cass of the Mama & Papas, talent agent and manager of several notables, David Geffen, and vocalist Ned Doheney on the far right. Times were good for the Love Generation as the movement was well on it's way to creating an icon. rings out with fond memories. This album sounds just as good today as it did the day it was released. Musicians on the album were an all-star cast featuring Tom Scott, Max Bennett, Wilton Felder, Robbie Robertson, Milt Holland, Chuck Findley, Joe Sample, Jim Hughart, David Crosby, Graham Nash, Susan Webb, Cheech & Chong, Jose Feliciano, Larry Carlton, Dennis Budmir, and swamp-rocker Wayne Perkins (as seen here). Joni Mitchell's growth as an artist had spread to the very top of the Pop and Rock arena as "Court And Spark" conquered the #2 spot on the album chart while selling over 4 million copies. Clearly this album stands alone while offering to be one of the finest albums in modern music history. 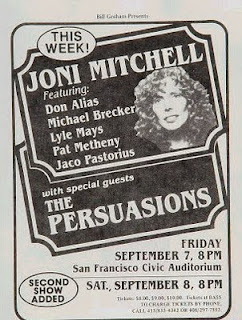 Joni's next offering was in October of 1974 with the release of "Miles Of Isles." This album was a selection of live performances and displayed her growing appreciation of Jazz-fusion. Again, like in her previous outing, the work of arranger Tom Scott and his LA Express is highlighted while the album scored a #2 on Billboard's LP chart. 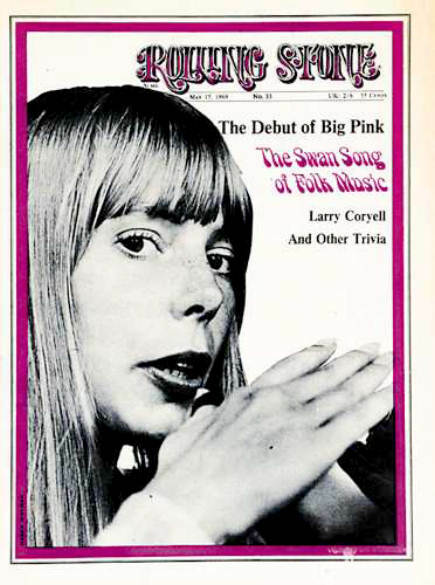 "The Hissing Of Summer Lawns" was released in October of 1975 and met with mixed reaction. Clearly the album (#4 1975) was a elaborate collection of complex songs that included African rhythms while venturing into the stage of world music. 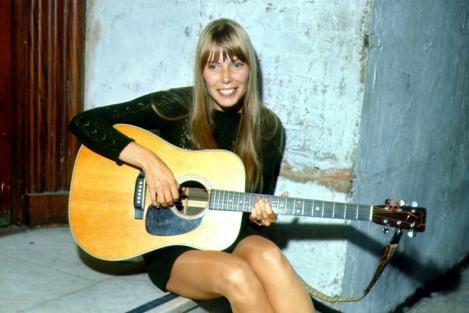 Significantly, Joni Mitchell was no longer a Folk singer. 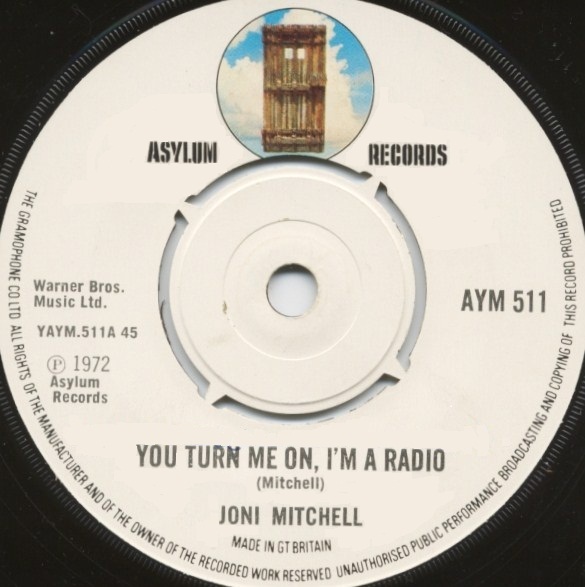 This album underlined Mitchell's desire to expand and explore into new horizons but it was not without critics. Just about the time that Mitchell was about to lose some of her core audience with this seemingly uncharted course, she began to acquire new listeners who enjoyed the journey. 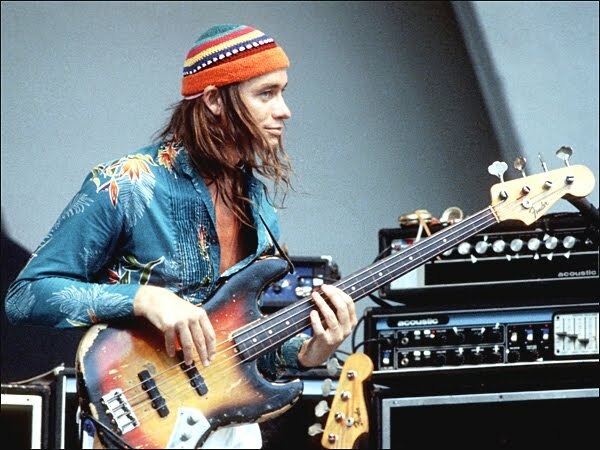 During this phase, another key element entered into the mix of her schooled journeymen, the adventurous Jaco Pastorius (right) and his fretless bass. 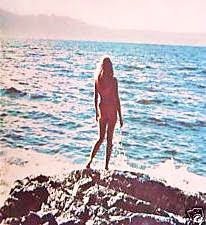 In November of 1976, the ever-restless Joni Mitchell released the "Hejira" album (BB chart #13) which prominently featured Jaco Pastorius and his spine-tingling lead bass runs. His style of playing was very important to Mitchell's sound and helped propel her to a new plateau. In an interview with Musician Magazine, Mitchell acknowledged his peculiar tones and claimed that "Jaco never played the root of a cord and had this unusual wide, fat swat of a sound" a tone that she craved for her songs. "Hejira" turned out to be a splendid album and struck the heart of many listeners while bearing her soul out-there for her audience. 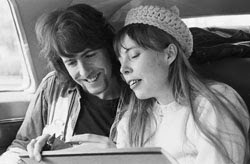 Songs like "Coyote" offered a return to Mitchell's confessional testimony of the growing conflicts of her romantic affairs (and break-ups) with a who's who in the music industry. Still, as the women's movement was gaining national attention, "Amelia" was Mitchell's contribution to the campaign while being an eye opener to a legend some had forgotten. Also on the album, "Furry Sings The Blues" was a touching story of a real down-and-out blues singer that she had paid a visit to in Memphis and shared a song about the dark experience. "Hejira" is a definitely a 5-Star classic album and highly recommended for the library of every music lover. Mitchell's remaining album catalog; "Taming The Tiger" Sept. 1998, "Both Sides Now" Feb. 2000, "Travelogue" Nov. 2002, "The Beginning Of Survival" June 2004, "Dreamland" Sept. 2004, "Songs Of A Prairie Girl" April 2005, "Shine" Sept.2007 and several compilations of greatest hits albums. 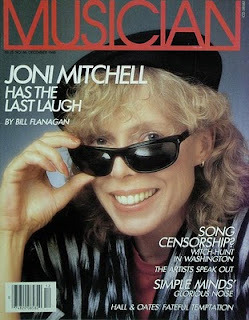 The entire selection of Joni Mitchells albums, CD's, Videos and Books can be purchased by entering the Amazon.com website posted on THE PHOTOLOG's front page. Photos credits; Henry Diltz, Joel Bernstein, Simon & Schuster Publicity, Rolling Stone Magazine, Wayne Perkins collection, Musician Magazine, MacLeans Magazine. 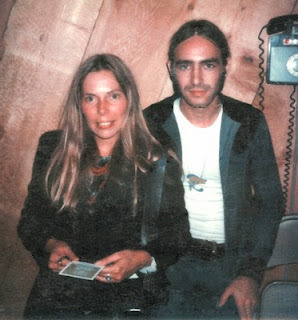 I was always open about my love on Joni Mitchell and her music. Having her "Blue" album in my record collection was a sign to young ladies that came to my apartment. I am sure it got me laid more than once. Living in LA I see her around occasionally; once at Hu's Chinese restaurant in Palms and once at the Arco station at Lincoln & Ocean Park Blvd. (even legends need gas). I resist the temptation to approach her and blather on about how much her music means to me. 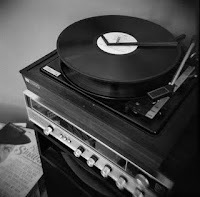 "Court and Spark" and "For the Roses"-both desert island discs for me. beautifully written tribute to one of the best ever. i had to leave a comment. Great review, Phillip. Joni's a long-time favorite, starting with Blue. You've encouraged me to get some of her later offerings which I missed. 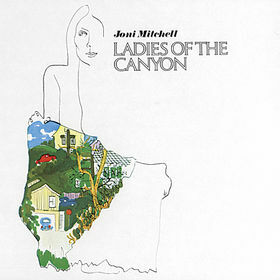 Definitely worth adding as a postscript that Herbie Hancock's "River: The Joni Letters" won the Grammy for BEST album of the year 2-3 years ago. The renditions of her tunes, as performed by herself as well as numerous other artists, is absolutely superb! "They paved paradise and put up a parking lot". "By the time we got to Woodstock, we were half a million strong; and everywhere was a song and a celebration." Was she really "Suite Judy Blue Eyes"? Thanks Staxman. What a great read. I caught the Joni/Jaco show in Providence in the 70s. Heaven sent! Well done Phil,saw her and fellow Canadian Leonard Cohen at Newport in 1966 and been an unabashed fan ever since. Working for WEA in the early 70's and promoting her records was a privilege and along the way never missed an opportunity to see her especially the Shadows & Light tour here in Miami w Jaco,Tom Scott & L.A. Express.